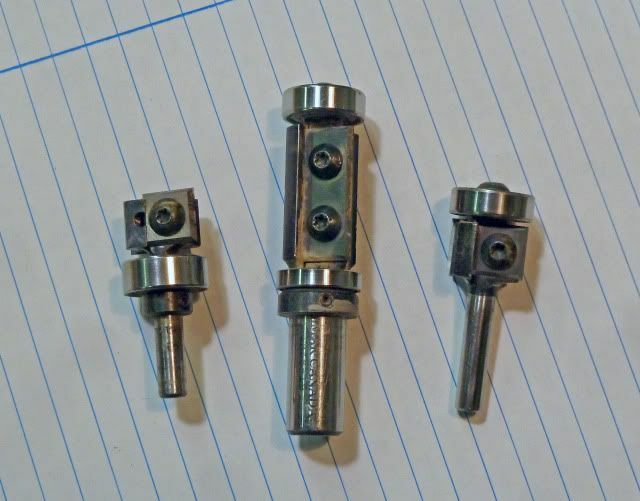 This is a review of Freud insert router bits but also a review of these bits in general as there seems to be some re-branding of the tools going on. I have bits from Freud, Amana, CMT and Dimar, some with identical bodies. Regardless of manufacture, having one of these bits would be an important addition to any shop. You can achieve perfect glass smooth surfaces on any wood, even going completely against the grain. Fluffy, curly snowflakes of shavings will hang in the air while you work and you simply won’t believe the quality of the cut. Bits are available in straight styles, different angled bevels and even in simple profiles (eg. rounding over). The centre left bit gives 4 different angles simply by moving the insert and relocating the bearing. The three pictured together are the workhorses of my day; I couldn’t imagine doing without them. The bottom bearing 3/4” inch bit is the least of the three in general but very important to me as we trim a lot of 1/8” solid edges on our furniture. I quickly get a dead smooth surface always and for daily use time really is money, perfect is a pleasure. This is also the premium bit for laminate or veneer trimming. The shorter length is preferred in a trimmer for run-out and vibration. The top bearing tool is a mainstay for pattern or copy work, with the added advantage of its rebate or dado fabricating & cleaning properties. It will make short work of a perfect square depth on any work. These 1/2” inserts cut on all 4 surfaces. 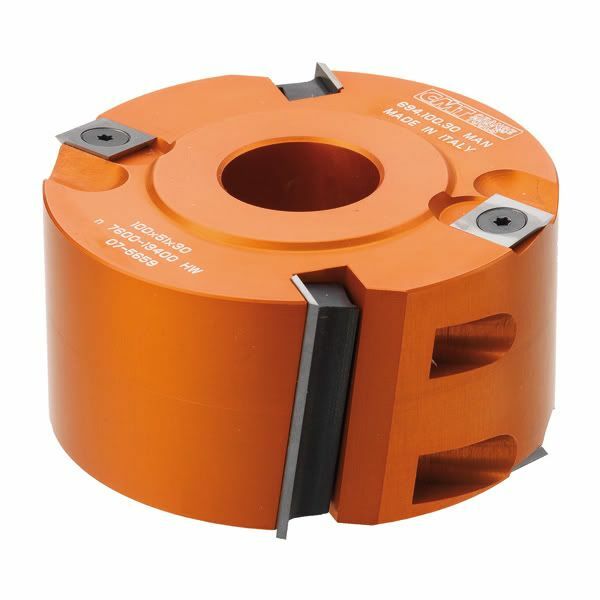 Freud and others sell this as a bottom bearing bit, but with the addition of a cheap 3/4” x 1/2” bearing and lock collar you more than double your versatility. When used with a router table, especially, you can follow a template on very difficult reversing grain and simply flip your template or stock, adjust the bit height and continue without disturbing your flow. Though pricey, insert router bits have many advantages over standard bits. 1. They are always the same diameter. With normal bearing bits, heaven is only when you first use them. Wear them out though, send them for sharpening, and they get smaller. You no longer have an accurate copy or true registration off your straightedge or pattern. Because of the relief angles involved this must be true. In contrast, insert bits will always give you perfect alignment. You change the accurate cutter, not grind it. 2. They cut much much cleaner, even near the end of their service life. This has to do with an inbuilt chip-breaker machined into the body. Conventional bits are in reality, flying wedges,, and depending on feed rates and material conditions you may experience massive tear-outs or have smooth sailing along the grain. Insert bits mitigate this behavior by causing the chip to curl immediately after shearing by virtue of the close set breaker. All modern jointers and planers have this feature and sometimes shapers. 3. They are cheaper, and far more convenient. The bit itself is expensive, that’s true. Expect to pay $70 – 80 or more for the large one. But replacement inserts are modestly priced, especially in packs of 10. ($2-$3 each) The true savings is in sent out sharpening costs. Each insert is double sided, the small ones 4 sided, (both available in standard or super tough grade ( for plywood, mdf, pc). What price perfect cuts with no tear-out? You need a razor sharp bit for that important cut. Change the cutter in a couple of minutes and go. You are not without your bit while it’s being sharpened. If I could give these bits 10 stars, I would. I’ve looked at these in the catalogs but haven’t known anyone who used one. Excellent review, thanks for sharing. Very interesting and informative review on something I would normally have ignored. Wow. I have never seen these. I need to get out more. They seem like a really good idea. Like you mention, this is the way jointers and planers are moving. I notice that you only show flush cut or at least bearing guided versions. Are their plunge version also? Thanks for all of the info ! 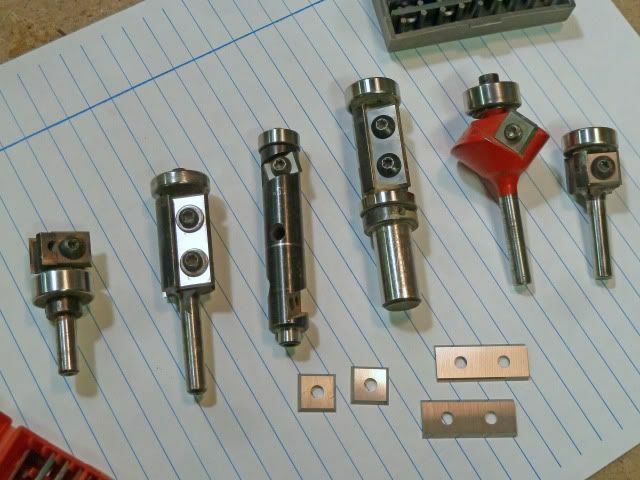 @SPalm – Yes, any of the bits using the 12mm (1/2”) insert will plunge. In the case of the bottom bearing bit shown you would need to grind off the bearing seat. Of course you are limited on the depth. I don’t have a longer version and am not sure if one exists. 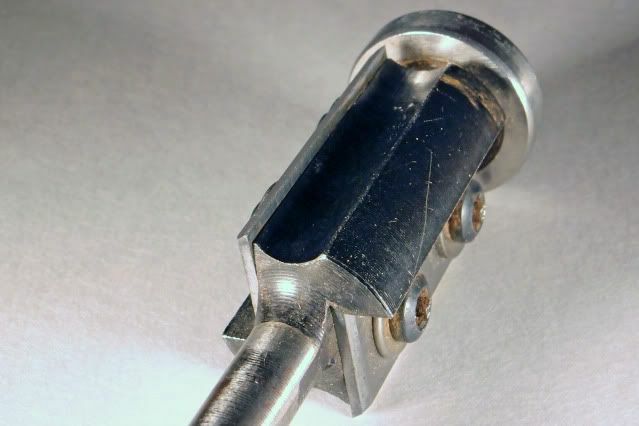 The 30mm straight bit without bearing that I have has a blunt end and can’t be worked this way though if you have a green stone for your grinder it could be easily modified to end cut. Thanks for this great review Gene ,very informative. These bit’s are totally new to me. Nice review Gene. I’ll have to look at these. Thanks for posting this. what are the blades made out of? carbide? hss? @Ben Langdon – These are, as mentioned, available in two grades of carbide. Steel would be nice as it can be even keener but either grade would do for casual work. Wow Gene, that is really cool. Basically making the router into a lower powered shaper. The knives on the Freud link come up as $3.80 for a 10 pack!! That makes a very affordable option compared to having to repurchase entire bit and shank. How would you compare this to the new Freud quadra cut bits. From what I read they have a bi directional shear that leaves the wood very smooth. Reading chopnhack’s comment reminded me of the Easy Wood Tools which use the same idea of employing carbide tips, but in turning tools rather than router bits. The cutting action then becomes what might be normally be called ‘scraping’, but – according to the designers – because of the precision cutting angles on the tips, very efficient and deep cuts can be made, and good finishes obtained. The great advantage is that the tool remains flat on the lathe toolrest – no bevel has to be ‘found’ and adjusted for cutting – the tool can just be fed straight at the workpiece, making it easier for people with poor grips, or beginners. Some members of my turning club were a little sceptical, but if one has spent years learning how to use a variety of bevelled chisels, it would be understandable if they felt that this method was ‘too easy’. Again, the initial cost is high. Great review! Well done and congrats. I will look into getting these now. Thx. Long Lasting CNC Tools Provide Superior Smooth Quality Cuts EVERY TIME. We chose Amana Tool® industrial quality CNC & Insert Bits for their reputation as leaders in manufacturing high-quality wood cutting tools. Extended tool life Cost-effective solution compared to replacing brazed router bits. I wonder how they can make that statement? Sharpening means to abrade away a surface and usually reduces how much metal is left behind. They have no way of knowing how the knife is going to be sharpened. Anyone agree that this is an ad or is there something to it that I am missing?